At 8.30 the local post office in Eyeries opens up and I am their very first customer of the day. I hand over a big box with 5 kg of lugage that I have decided not to use anymore during this trip. The lady takes 20 minutes to make sure that the parcel is wrapped in so much tape that it will arrive home safely even when it would fall of the plane. I start today’s hike with a great feeling of relieve; I estimate that I still carry some 12 kg’s on my back but it’s a huge improvement. 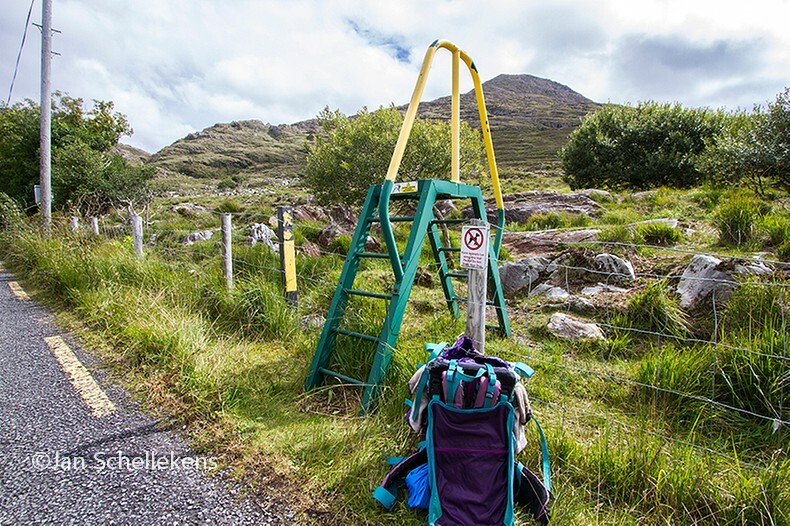 I leave Eyeries northbound and after some gentle up and downhill km’s, during which I pass some local speedwalkers, the trail leads to the local coastal road directly next to the Atlantic. The weather is again very good, with a few clouds here and there, a lot of blue sky and temperatures of around 20 degrees. After 6 km’s the trail leads to the northeast, into the fields. Shortly after it leads parallel to the Lake Fedda. Along the lake the trail is very well marked but it leads through 1.5 km of marshland: here and there the water that stays on the soil is up to 30 cm’s deep. I manage to keep my hiking boots dry by putting on my rubber croqs! After the marshlands to road to the village of Ardgroom (one shop, several B&B’s) is easy, but narrow. The trail continues to use the regular road for a few more km’s and then crosses the fence and goes through the fields eastbound, straight up the hill. By the time I arrive up the hill, at the isolated section of today’s hike, the weather has changed and the increasing wind announces that it will raining within shortly. In the fields in the next km’s the signs are not so easy to be found, and it starts to rain pretty bad. After half an hour I reach the section where it goes down the hill, using an easy fieldroad. After one hour of rain it becomes dry again, but it remains cloudy. Before I arrive down the hill there is another marshy section that needs to be covered. The trail leads fortunately through some rocks to guarentee dry feet to the hikers. 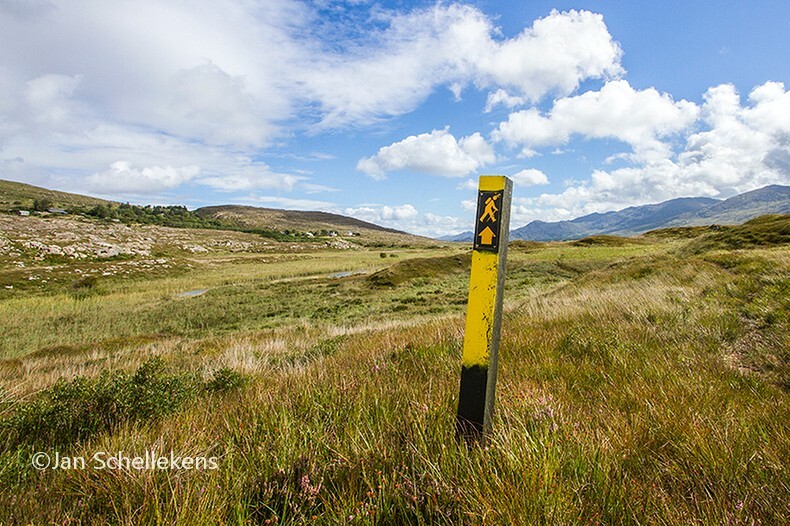 Directly after this section I cross the first (very low) trees during my hike in Ireland. When I arrive on the regular local road the trail traverses a few more km’s (pretty endless) untill it reaches the wide spread village of Lauragh (one B&B, one church). I stay for the night in the B&B Mountain View. 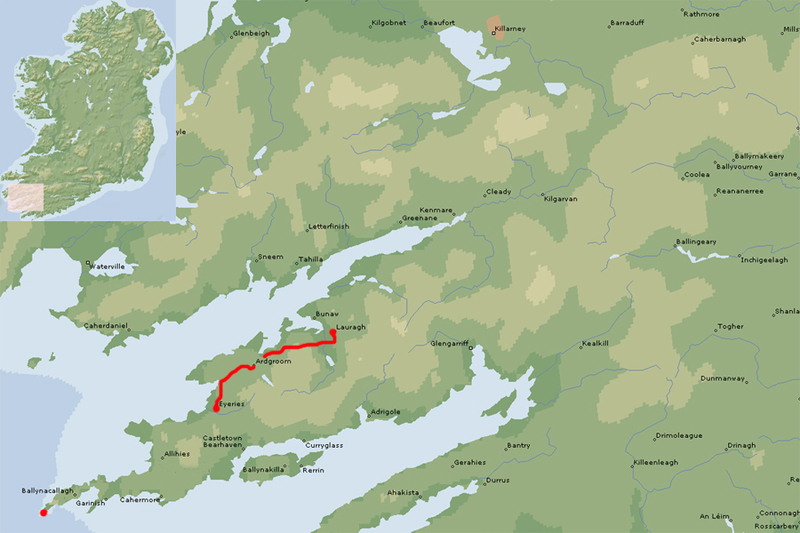 The ladyhost is very interested in the trail on the Beara peninsula, the E8 in general, and she also knows the trails to and from Lauragh from her own experiences, which is valuable.